Got back last week from touring the West coast of Ireland on my lonesome. Long story short I provisionally planned this trip at the end of last year to do in April/May time with my friend. Unfortunately he passed away in a freak work accident in December so knocked me back a bit. Anyway 2 weeks ago the wife gave me an ultimatum either go next week or that's it for the year due to other commitments. So I got the new tyres fitted on the Friday, booked the ferry over the weekend and was off the Monday morning. Travelling from Great Yarmouth to Holyhead had a lack of drama with generally good weather until I was about 20 minutes from Anglesey when I stopped for a leg stretch and a smoke. I was in a restaurant car park, finished my smoke, looked around for a bin which there weren't any in the car park and dropped my cigarette end with the dozens of others and empty crisp packets and discarded coke bottles etc. At that point somebody walked out of an unmarked van and read me my rights....you know, "you have the right to remain silent etc etc" I jest you not, no can you pick it up or this is a warning just read me my rights and fined me £75...great start to the trip. It's a good job the B+B's bed in Holyhead was so crap as I couldn't sleep anyway cos I was so mad..
Next morning got up and caught the ferry from Holyhead to Dublin. 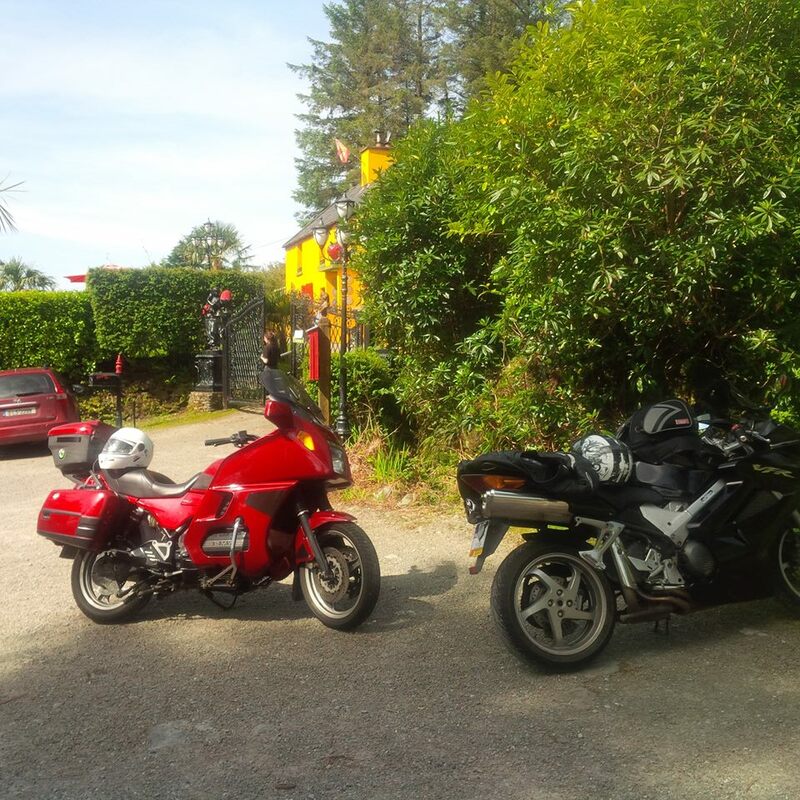 Ended up sitting with an Italian couple on their 2010 Honda Goldwing who had come from Milan. Lovely couple who had been all over Europe on their GW. Off the ferry and headed for Kinsale, the official start of the WAW (from the south). It was raining by now and due to the time of the day only managed a couple of hours along the south coast before having to travel to Ballylicky for my first nights accommodation. The next day the weather was excellent with sun all day so set out to do the Beara peninsula and the ring of Kerry. I was expecting traffic to be far busier than it was. I was warned about the potential for traffic especially on the ring of Kerry but fortunately found it light. The Beara peninsula was fantastic with lovely views of the coast but the riding was quite hard barely getting out of second gear a lot of the time. I finished the day going to the Dingle peninsula (I think its called) and managed most of it before the time was getting on so went to my next night's accommodation in Tralee. The coast road between Tralee and Galway was probably the least interesting to see from a view perspective but the roads got quicker and were generally better. I ended up getting the ferry from Tarbet over to Killimer which would save me riding around Limerick. I ended up riding through Galway and stayed in a place called Spiddal on the coast. The hotel was expensive but quite nice. The only parking was on the main road so was a bit worried that the bike would be there I the morning but had no problems. The next day was the ride to Sligo. The weather in the morning was ok bit of light rain and overcast but not too bad. At lunch time I stopped at a lovely little café on the coast but in the afternoon it absolutely poured it down and it was the first time I had to wear my waterproofs. By the time I got to Sligo around 5 ish I was dripping wet. The next day was technically the last day of the WAW as it was from Sligo to Londonderry. Again the weather was bad all day and I got a soaking. It was a shame because the scenery off the coast was really good but due to the low clouds and heavy rain made it hard to see. The last day I decided to go from Londonderry and follow the Causeway Coastal route stopping off at the Giants Causeway. The Giants Causeway was ram packed but the nice car park attendant told me if I parked in the dedicated car park he would have to charge £10.50. But if I parked around the corner I could walk in for free. What I wasn't expecting as you go under the tunnel is that you then have about 20 minute walk each way to get to the actual attraction. I walked half way took some photos and came back. I then followed the coastal route around to Larne which strangely was probably one of the nicest bits of coastal road I did in the whole week. I did 2147 miles door to door. My bike, a BMW GSA 2016, didn't miss a beat for the whole trip and generally very enjoyable. I'm glad I didn't camp in the end as the weather was generally crap for the week. I missed a bit of the WAW out purely due to time constraints. There are so many beaches or view spots etc that I could have literally taken another week going to them all. I visited a few but once you have seen a few beaches then that was enough for me. I always like to come back from a trip and think I've learnt something. - Rock straps - should have had them years ago. 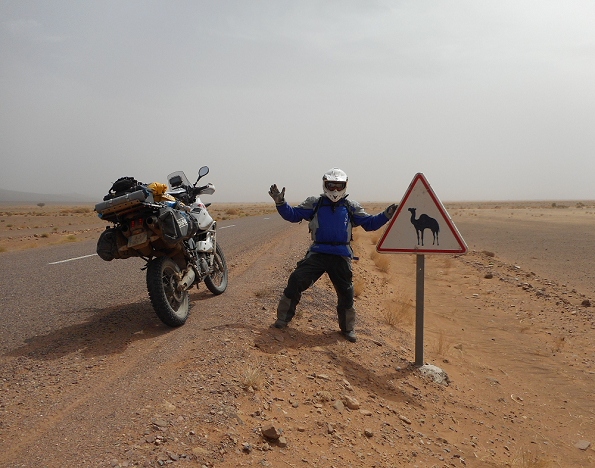 - Travelling without panniers made the bike feel lighter and seemed to handle better. - I need to sort the seat out on the GSA as it's not massively comfortable for me. - The weather in Ireland is pants...even in July. You probably passed my house in Cork. I live on a narrow rural road but anyone setting a satnav for the shortest route to Kinsale gets routed round my corner. I would say 70% BMWs too. Would have been nice to do a catch up. Glad you enjoyed the trip but trust me its a way different experience taken slowly like a good whiskey. I have done all the routes you travelled over the last 45 years or so and the north Antrim Coast is a stunning one. Most of the times I set up a camping base for a week at a time, never been anywhere to beat that set up in good weather. Tips: Check weather before starting and plan the route accordingly. It generally will always rain so one must plan for it. Big heavy bikes loaded up with panniers probably not ideal for it. Plan A is go lightweight and possibly hotels but thats not for me. The Plan B is go more slowly and use a base for 2 or 3 days that you can explore and ride without panniers etc on. Camping on the route is great, especially if you have a 2 or 3 day base. The Giants Causeway is worth going to when you are near but its quite a disappointment if you travelled a long way just to see it and that walk is a killer. The parking there is good and you found the 'bike parking'. Torr Head drive and Cushendall etc and an ice cream on the seafront at Ballycastle are very enjoyable. Strangely I checked the weather the week before and it said it was meant to be overcast but dry all week. I only booked the first and second nights accommodation before I set off. Then around 3 ish everyday I would look to see where I could possibly get to then got on booking.com and booked accommodation for the night. Initially my friend and I were going to camp and look for a place to set up for a couple of nights and use that as a base. If I did it again then around Bantry would be a good place to set up for 2 or 3 nights base as going around the southern pennisulas seemed to take a while. I used a camp site near Bantry at Eagle Point. Lovely spot and a decent supermarket and petrol station opposite the entrance. Its between Bantry and Glengarriffe and brilliant for the peninsulas including the Ring of Kerry, Healy Pass, Caha Pass, Beara Peninsula and places like Mizen, Dursey etc. Weather on Atlantic Coast you need to look at it every day and get a feel for how its working. I would literally roll off a ferry, check weather before going and then decide if its to be a base at Bantry, Burren, Westport or wherever. It's worth it because in good weather these places are awesome. I smile when I see all the BMWs......but obviously a reason for it. Stick with my Ks for now though.